The theme of the auto-da-fe, that is, the burning of heretics, was one of the revered in Spanish church painting. The images on these themes were not only adorned for altar borders, but were often placed next to a large altar. So this work: first intended for a small composition in the gallery of the monastery of Santo Domingo de Avila, it was moved to the temple and installed near the main altar. In the 13th century, a crusade was declared against them, the war lasted more than 15 years. As a result, the beautiful and blooming provinces of Provence and Upper Languedoc were devastated. The pope sent a whole army of inquisitors, mostly Dominicans, who built persistent Albigensians at the stake. In the XIV century the Inquisition raged in those places. The upper part of the composition is occupied by the tribunal sitting with the standard of the Inquisition under the high canopy. The death sentence is read, the last orders are given and executed, the priest calls convicts to repent before his death, the public is waiting for imminent punishment of the heretics. 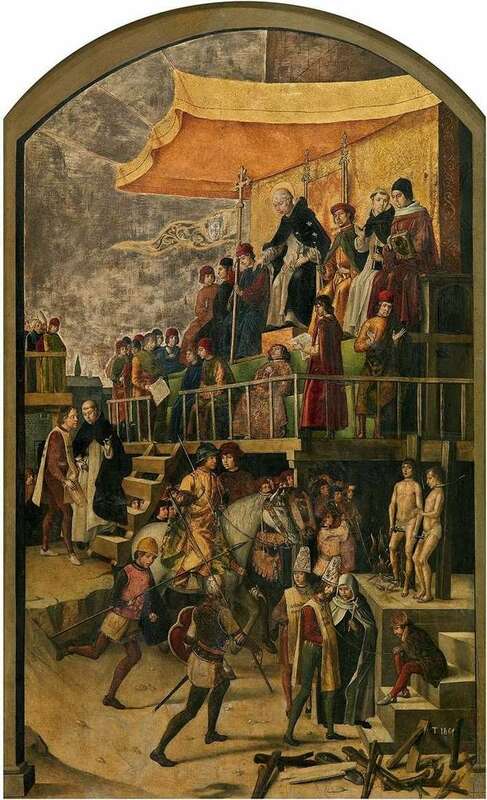 Description and meaning of the painting Autodafe by Pedro Beruguete.